Galagoda Dissawa (Adikarams brother) in the Royal Service of King Keerthi Sri Rajasinha (1747-1781). Recipient of the second and third Land grants in 1760 AD & 1772 AD (Wall painting from Talawa Temple at Marassana). Galagoda Adikaram in the Royal Service of King Keerthi Sri Rajasinha (1747-1781). Recipient of the first land grant in 1750 AD - (Wall painting from Talawa Temple - Marassana near Kandy). Galagoda Adigar was in the royal service of King Keerthi Sri Rajasinghe (as the Chief Minister) during the Golden era of the Kandyan Kingdom. During this period Kandyans constructed a large number of places of religious worship, and stood against the Dutch invaders and they even managed to destroy several Dutch forts. His descendants served the Kings faithfully and, received several large land grants for their royal service. Dr. Mrs. Lorna Deveraja in "Spolia Zeylanica" published several of these Sannasas. Once Kandy declined, under British rule his grand children were executed and deported for taking part in the Uva rebellion in 1818. The last family member to lay down his life in royal duty was Galagoda Nilgala Korale, who died in early 19th century, while trying to arrest the murderer Tissahamy. Korale knew Tissahamy well, but he shot Korala (mistaking him for a Policeman) as he was covering his head with the coat of a police officer while the rain was drizzling. Two expensive rings studded with rubies, worn by Korala were taken by his killers, but thrown away subsequently fearing identification. This family history is well documented for the family hardships they had to endure whilst trying to preserve or to regain Kandyan sovereignty. The name of the Galagoda family is not mentioned in the recent Kandyan history (under British rule) as several family members took part in the 1818 Kandy Rebellion against British. They were either executed, deported or had their lands confiscated. As unbending Kandyans they paid the supreme price of fighting for the freedom of their motherland. This family had served as the Chief Minister or the "Maha Adigar" to the King (1745) and at the same time Galagodas brother held the post of Dissawa of Uva and Nuwarakalaviya (modern Anuradhapura). Between Galagoda Adikaram and his brother they planned the war against the Dutch in 1760 destroying several Dutch forts Mathra, Katuwana, Marakade. This was the last successful rebellion against any foreign invader. In the same tradition, late in the 19th century one of their descendants  Galagoda Korale of Nilgala laid down his life while trying to capture the murderer Thissahamy in Ambilinna. This family could thus be traced back to 1600 AD, according to Dr. Mrs. Lorna Devaraja, who has published details of several land grants given to this family by Kandyan Kings. Their bloodline has been traced up to the 19th Century based on documents found in British Museum and in the National Archives. Definitely, this covers a much wider time period than the bestseller "ROOTS" which was published in America. The Galagoda family had a tradition of military service dating back to 1600. They are from Megodathiha Hewahata. They were in the Royal Service of King Senarath (1604-1635). A Galagoda Dissawa was decorated in the battle of Randeniwela (1630). He also mobilized troops for the battle of Gannoruwa (1638) defeating the Portuguese. For this he was awarded the Governor ship of Hewahata by Rajasinha 11 (1629-1687), thus consolidating his roots in Hewahata. Another Galagoda served under King Vimaladharmasooriya (1687-1707). 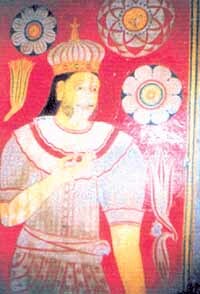 The King Sri Vijaya Rajasinha (1739-1747) had a member of the family serving in the provincial administration. The king Keerthi Sri Rajasinha (1747-1781) selected from, their descendent two brothers; one to be his Maha Adigar & the other was given the next highest rank of Dissawa. During the period of King Rajadhi Rajasinghe (1781-1798) both Kandy and Anuradhapura dissawa posts were held by two Galagoda brothers. It is said in the "Mandarampura Puwatha" that the poem was brought up to date in 1702 AD, at the request of Galagoda Dissawa in the royal service of King Vimaladharmasooriya (1687-1707). Galagoda Adigar hated the Dutch & made no secret of it. A grant of kind signed by the Adigar Galagoda was made to Mulkirigala Vihara in 1761. He was the first Adigar, Basnayaka of Patthini Devalaya, chief of sword bearers, stables, elephant corals, palace dancers, palace potters, Dissawa of Putlam and Sabaragamuwa and Attapatuwe Lekam. The Kings principal officer was the Adigar and they acted as advisors to the king, as chief justice and military chief or as the commander in chief. He had to lead the army to battle. The Adigar signed all land grants made by the King. The honours due to Adikaram were, second only to those due to the King. He was preceded by numbers of men cracking whips. All on the road had to make way for him. The Adigar could hold his office as long as the King wanted. He had to pay king five hundred "Silver Coins" on appointment, and a similar sum every new year (dakum). The Adigars in turn appointed junior officers & received around 10 silver coins per year from them. Adigar further received a portion of fines collected, income from ferries operated, and from liberated prisoners. The last signature in the Kandyan Treaty of 1815 belongs to Galagoda Maha Adigars son Galagoda Nuwarakalawiya Dissawa who refused to sign the treaty for two days-and so did only after the English Governor promised to safeguard Buddhism & Kandyan traditions. King Keerthi Sri Rajasinha and the last Kandyan king Sri Wickrama Rajasinghe gave this family several land grants. The first grant was in 1750 and a palm leaf copy of this could be found in the British Museum. 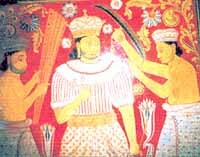 It was given to recognize Adigars loyally to the new Waduga king, who came to the throne after ruling the country for 3 years, without being crowned due to fears of an uprising. The second land grant was given to the Adigars brother in 1760 for the gallantry shown in "the Mathra Katuwana war" and after destroying several Dutch forts. This war against the Dutch was master minded by these two Galagoda brothers. They killed all the Dutch prisoners who had surrendered, and destroyed the forts. They also fought against the armies of the Dutch governor Baron Van Eck in 1765 and defeated him on his way back to the coastline. The first targets were the drummers who conveyed orders over long distances and the conspicuously clad officers, who could be easily spotted. Adigars brother Dissawa again received a third land grant in 1772 for the faithful service rendered to King Keerthi Sri Rajasinha and a copy of this can be found in a copper plated sannasa kept in the British Museum. The fourth land grant was given by King Sri Wickrama Rajasinha to Galagoda Karawile Mudaliya, for his gallantry shown against the British in 1806. This is possibly for service against the army of Lt. Colonel Arthur Jonstan (19th regiment) that invaded in Kandy (in 1804). Capt. Jonstan had a strong body of 300 troops & scaled the mountains from the Uva Mahiyangana side to reach Kandy. His entry to Kandy was a psychological shock to Kandyan nobles as he had taken a secret path neglected by them. He had to get back to Trincomalee with a loss of 38 troopers as Kandy was abandoned. The villagers, going to worship at Mahiyangana Temple during the festival season, used the path made by him which is known as 1000 steps for a long time. Galagoda was made the first Adigar as he saved the king from an assassination plot planned to make the King fall in to a pit fitted with long spikes near Malwatta Temple. The Malwatta priest in connivance with Samanakody Adigar (who was subsequently executed), tried to install a Siamese Prince in the Kandyan throne. This famous Galagida Adigar was the grand son of Mumwatte Bandara  a poet and a very learned man a favourite in the Kandyan Court  whose name appears in the sannasa (official document) handing over the first land grant. After the assassination plot, the position of Galagoda became much stronger. He was now the first Adigar and had ten other offices given to him. Two of his brothers were made provincial chiefs; One was made the Dissawa of Uva and other the Raterala of Harispatthuwa. With King Keerthi Sri Rajasinghes blessings, Galagoda Adigar built and renovated a large number of Buddhist-temples and was much respected by the Dutch. During his reign the Siamese priest "Siam Upalee" head of famous "Siam-O-Palee-" maha nikaya brought the long lost "Upasanpadawa" to Ceylon. One of the first monks to be ordained at the hands of Siyam Upali was the monk Kobbakaduwa and he was the son of Galagoda Kumarihami who was in turn the daughter of Galagoda Dissawa of Uva. This period is known to be the golden era of the Kandyan kingdom. A large number of Buddhist Shrines were completed. The people looked up to the King, as their saviour and they were able to rise up against the foreign invaders. Portraits of Galagoda Adikarama & his brother Galagoda Dissawa (who master minded the Mathara Katuwana Hatana) can be seen even today in Talawa Rajamaha Wiharaya at Marassana near Kandy. There are very many life-size portraits of King Keerthi Sri Rajasinha in all the temples he renovated & built. But the most famous are the four " Life sized wooden statues of the king today, two of them can be seen at Dambulla Temple & at Malwatta Temple in Kandy. Galagoda Adigar & his brother Dissawa had three children. The Dissawa of Uva & Nuwarakalaviya, Dissawa of Kottegoda, & Wahala Mudiyanse posts were held by them at some time. Galagoda Dissawa of Nuwarakalawiya, (who signed the Kandyan treaty of 1815) had 6 children. Four of them suffered severely under British rule for taking part in Uva Uprising in 1818. Galagoda Wellasse Dissawa, the eldest, was executed for treason by the British (in 1818) along with his grand son Ratemahanthaya. His second son  Galagoda Aspanthiye Nilame had his lands confiscated. His third son Galagoda Peradeniya Disssawa died in the Uva Rebellion (1818). Peradeniya Dissawa was banished by the Kandyan King, but managed to come back to Kandy after 18 years and got his lands restored. He died in the 1818 rebellion. The fifth son, known as Kotte Dissawa, had his lands confiscated & deported to Mauritius. This Kotte Dissawa  who was deported to Mauritius  had 3 children. His second son Tikiribanda Galagoda had one son named Galagoda Loku Banda. This Kotte Dissawa had his name engraved on an iron ring fastened on to a slave which was given to him by another Dissawa, according to John Doyly. This Loku Banda had petitioned the British government several times claiming ownership of land at Atimole by way of a sannasa (forth grant Karawile Sannasa) given by King Sri Wickramarajasinghe. The British entertained this claim & there is an entry to this effect confirming the ownership in the Land Kachcheri dated 1870. Galagoda Loku Banda had five children. One of them was the Abayasingha Bandara Galagoda; a famous Korale who died trying to capture Tissahamy at the young age of 34. He was a direct descendent and a fifth generation grand child of Galagoda Maha Adikaram who masterminded the famous Mathra Katuwana war against Dutch in 1760. The financial value of each sannasa would have been immense as several villages were given to the beneficiary under each land grant. These grants of "Paraveni" land gave their heirs the right to inherit them. The first land grant was from "Megodathiha-Hewahata" Unantanna village and the second grant is from "Udunuwara-Ellepalewela" (now donated to Dalada Maligawa). The third kind grant was from "Hewahata-Karandegama", and the forth was from "Atimole-Karawila Pallegama" from Uva District.